DTCB 2016: Our most successful yet! This year’s Dancing Through College & Beyond event was its most successful yet, boasting nearly 300 registered students (not including their parents! ), over 45 participating colleges, 27 auditioning colleges, and 15 schools offering scholarship awards to their respective dance programs. The 92nd Street Y was packed and buzzing with high energy from students & parents. Dancing Through College & Beyond (DTCB) is Dancewave’s annual free event providing access and resources on dance in higher education. The event encourages high school dancers to follow their passions while opening their eyes to the many possibilities higher education and dance present. 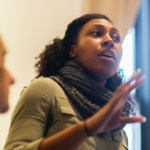 The event consists of a college fair, facilitated peer-to-peer sessions, panel discussions, and auditions. Each activity widens the dancers’ preconceptions surrounding dance in college and as a career. 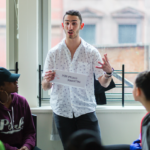 DTCB kicked off on Friday, October 21, with a showcase from a handful of participating colleges: Marymount Manhattan College, Slippery Rock University, The New School, Boyer College at Temple University, and Pace University. The showcase presented a variety of dance, highlighting the various stylistic possibilities when studying dance in college. 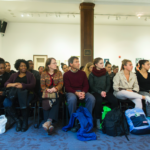 During the performance, Buttenweiser Lounge at the 92Y was full of excited parents & students preparing for the long day ahead. Slippery Rock students perform “Dissatisfied” choreographed by Alexandra Rodwick at Friday’s showcase. 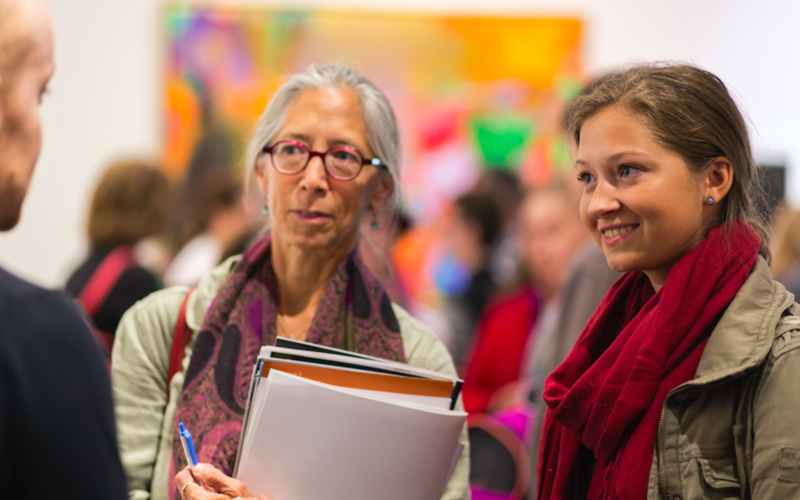 DTCB’s main event started bright and early on Saturday, October 22 as students and parents checked in and proceeded to the hall of mirrors to select the schools they would like to be considered for at the audition. College dance hopefuls left their resumes and headshots in boxes representing the colleges for which they were auditioning. Students chose as many or as few colleges to audition for as they wished. 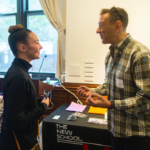 The college fair began with representatives informing prospective students why their school was the perfect place to study dance in higher education. Each school represented at DTCB offers quality dance training and academic courses complementing the major. Aiming to create well-rounded artists– each school offers unique experiences. During the fair, prospective students were invited to join peer-to-peer discussion sessions with students from different colleges. 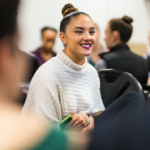 The peer-to-peer discussions allowed participants to hear about the experiences of college dance majors first hand. After a morning filled with student-focused activities and a much needed lunch break, the “Careers in Dance” and “Financial Aid and Admissions” panel discussions commenced. Parents enjoyed learning about financial aid opportunities available at various schools and receiving advice on how to budget for their child’s college education. 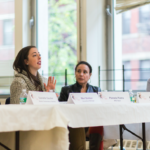 The “Careers in Dance” panel drew students and parents into a discussion about the breadth of opportunities available for passionate dancers entering the workforce. Panelists including Dance Educator Jody Arnhold, Dance Journalist Siobhan Burke, and Dance Entrepreneur Diane Jacobowitz discussed their career paths and how a passion for dance helped them remain successful in their fields. After the panels, anxious dancers hurried to Buttenweiser Hall to participate in the biggest college dance audition in the country. Representatives from 27 college dance departments sat and observed auditioning students in a ballet barre warmup and modern center. 15 of the 27 auditioning departments also offered merit-based scholarship opportunities. The opportunity to audition for so many schools in one location eliminated the struggles of traveling around the country for individual school auditions. Dancewave also wants to extend a special thanks to Dancing Through College & Beyond’s sponsors! 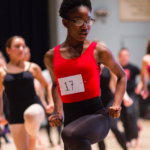 Dancing Through College & Beyond is made possible through the support of the Dance Education Laboratory, Dance Magazine, Harkness Dance Center, and New York Department of Cultural Affairs. Thank you to all the attending families, students, college representatives, and volunteers who helped make Dancing Through College & Beyond such a success! Stay tuned for next years event by following @Dancewave on Facebook, Instagram, and Twitter. Come detox from a hectic audition season at Dancewave’s Wellness Fair. 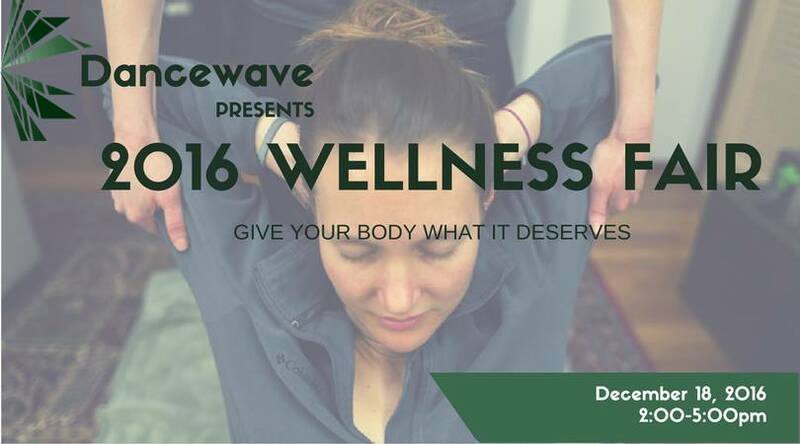 A day of affordable and accessible bodywork, Dancewave’s first wellness fair offers a variety of holistic practices from experienced local practitioners at drastically reduced rates. The Wellness Fair will include Acupuncture, Thai Massage, Reiki, Zen Shiatsu, and Chiropractic Work. Relax and enjoy bodywork at the affordable rate of under $1 per minute! Sign up below.